KTH-dESA hosted the Fourth Workshop of the Open Energy Modelling Initiative. On April 28-29th 2016, KTH-dESA hosted the Fourth Workshop of the Open Energy Modelling Initiative. Over 50 reasearchers in the field of energy modelling, from various European and non-European research institutes and universities, participated in the two days activity. The workshop covered various areas of interest in the break-out groups like: Data collection, Water-Energy model coupling, Programming Languages, Data management, Data harmonizing, Electricity network modelling, Modelling outflows and Outreach. Researchers from KTH-dESA gave presentations on past and ongoing research efforts in the field. During May, in the framework of a collaboration between Universidade Federal do Rio de Janeiro and KTH-dESA, PhD candidate Gustavo de Moura is visiting KTH-dESA to develop Power System Scenarios for the South America Model Base "SAMBA". The current version of the model is available here. It will be expanded in order to consider all Latin America countries. On May 9-10th officials from public authorities and the electricity utility in Cyprus were introduced into the use of OSeMOSYS. In an ongoing collaboration with the local government, an OSeMOSYS model of the entire energy sector of Cyprus is under development. Upon completion of the project, the model will be handed over to the government following another series of training sessions. 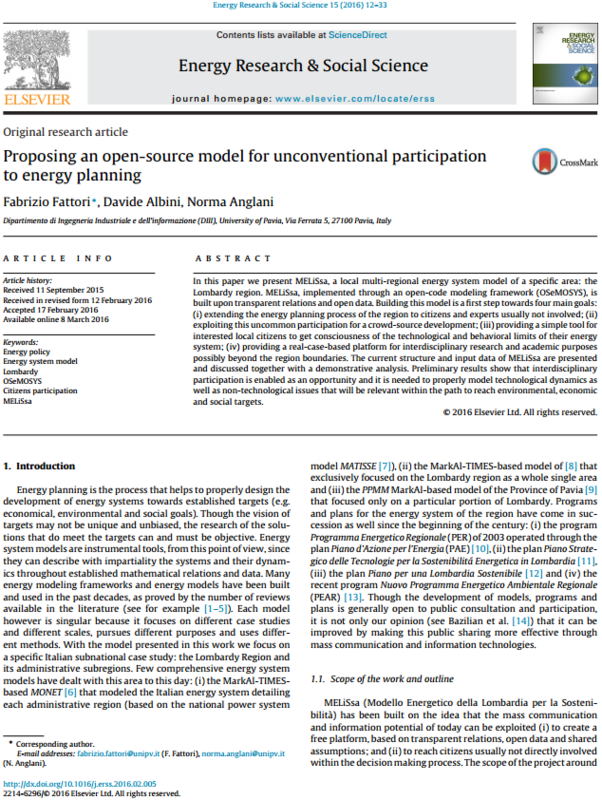 Researchers from University of Pavia-Italy have developed MELiSsa, a local multi-regional energy system model of the Lombardy region in Italy, based in OSeMOSYS. The model is built using transparent relations and open data. Building this model is a first step towards four main goals: (i) extending the energy planning process of the region to citizens and experts usually not involved; (ii) exploiting this uncommon participation for a crowd-source development; (iii) providing a simple tool for interested local citizens to get consciousness of the technological and behavioral limits of their energy system; (iv) providing a real-case-based platform for interdisciplinary research and academic purposes possibly beyond the region boundaries. The full paper can be found here. Regions covered by OSeMOSYS models have expanded to now include the middle east and specifically the Kingdom of Saudi Arabia (KSA). 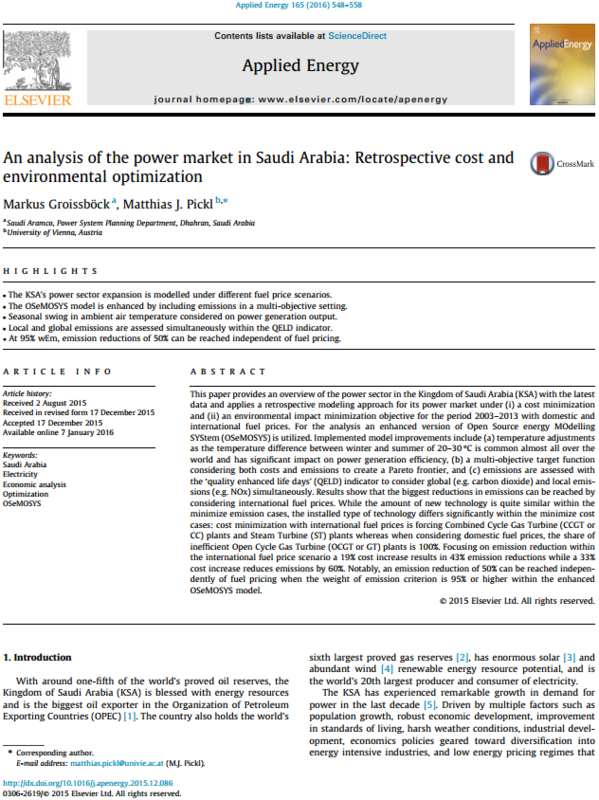 In this study, the authors provide an overview of the power sector in the KSA with the latest data and applies a retrospective modeling approach for its power market. The study uses (i) cost minimization and (ii) an environmental impact minimization objective for the period 2003–2013 with domestic and international fuel prices. 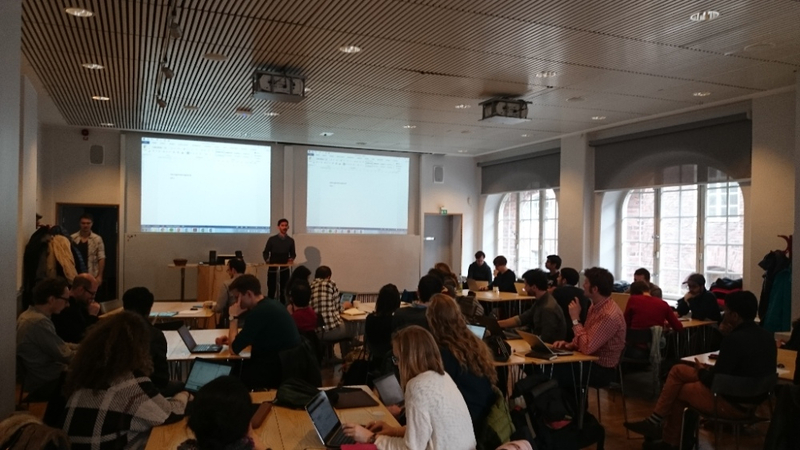 This week KTH-dESA is hosting the 4th openmod workshop, wherein a large set of new resource mapping efforts, energy databases, and open modelling tools will be presented. OSeMOSYS will be among a diverse range of open models presented at the workshop. More information about the meeting and more on the open tools can be found here. 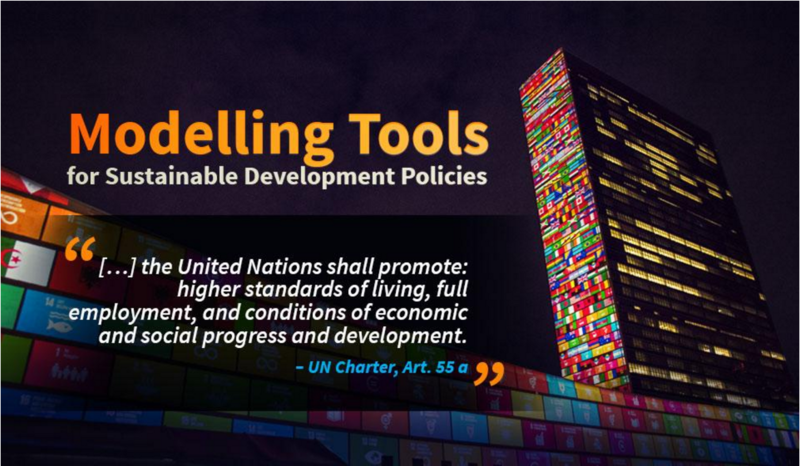 On 18 February, the United Nations Department of Economic and Social Affairs (UNDESA) launched a web-based platform 'Modelling Tools for Sustainable Development Policies' designed to strengthen countries’ technical capacities. OSeMOSYS, and other modelling tools developed at KTH-dESA, contribute to several aspects of the the platform. The suite of models will strengthen countries’ capacities to formulate their national strategies for sustainable development through the integration of economic, social and environmental policies for achieving the SDGs. 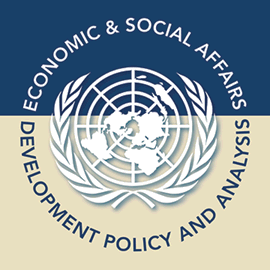 The platform is hosted on UNDESA's website. Two energy system researchers, Fabrizio Fattori and Francesco Gardumi, completed their PhD theses which were based on OSeMOSYS. Fabrizio's dissertation is titled, "Approaches to Some of the Emerging Challenges and Opportunities of Energy System Models" and was completed at the University of Pavia, Italy. 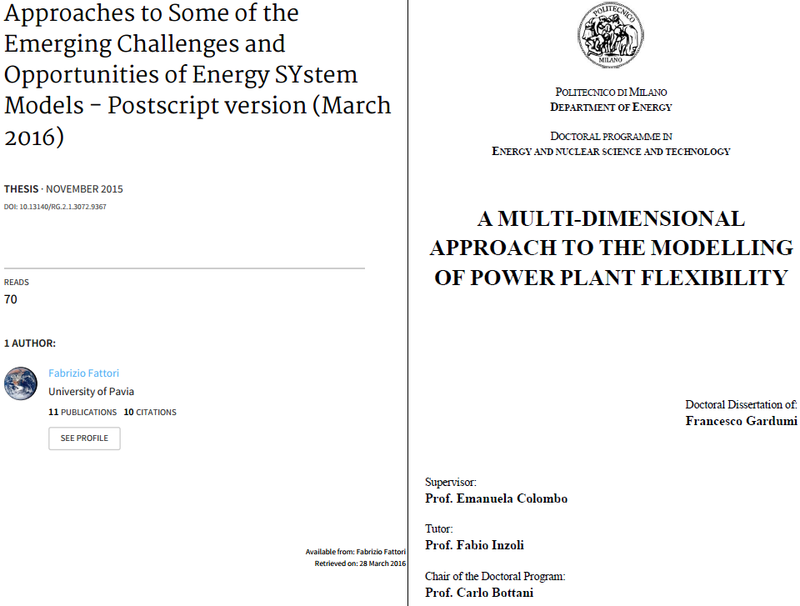 Francesco's dissertation is on the topic, "A multi-dimensional approach to the modelling of power plant flexibility" and was completed at Politecnico di Milano, Italy. After two workshops in Berlin and one in London, the Fourth Workshop of the Open Energy Modelling Initiative will be in Stockholm, Sweden hosted by KTH on 28-29 April, 2016. As always, there is no registration fee, so feel free to join! Openmod wiki page will be updated frequently with practical information and program updates. All participants are invited to contribute suggestions of different sessions to be included in the program. And in the meantime, feel free to register on the mailing list where all things regarding energy modelling are discussed. 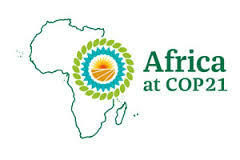 The Electricity Model Base for Africa (TEMBA) was the centrepiece of a COP 21 side event, and co-authored by the UNECA, with speakers from the Ghanaian Energy Commission and the World Bank. 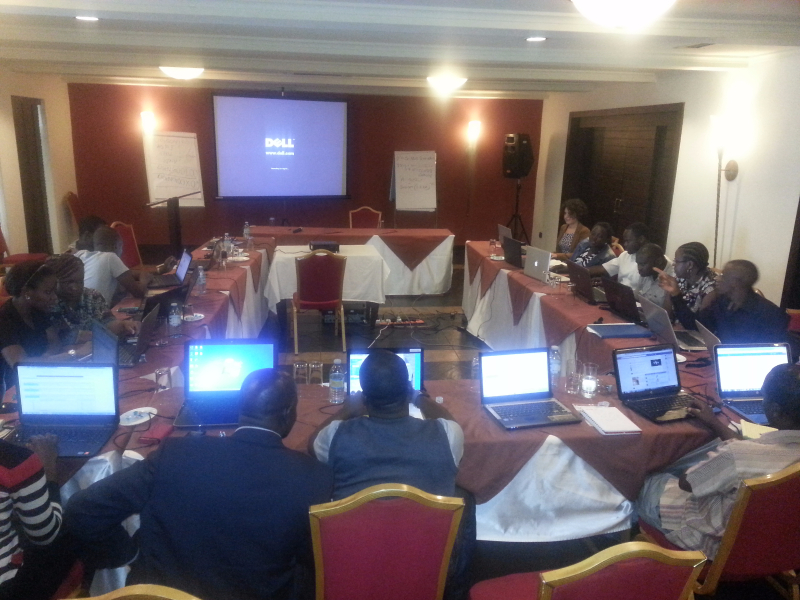 This session focused on energy mapping and energy planning in Africa. TEMBA, as an open source energy modeling tool designed to inform the development of medium and long term energy strategies so that policymakers can allocate resources most efficiently. It is available online and is free to use. A new version of the OSeMOSYS code, OSeMOSYS_2015_08_27, is now available for download on the OSeMOSYS website. The main updates in the code include modifications to improve the robustness of the code, optimisation time and minor bug fixes. An updated sample data file compatible with this latest version of the code has also been developed and available along with the code. The suite of models will strengthen countries’ capacities to formulate their national strategies for sustainable development through the integration of economic, social and environmental policies for achieving the SDGs. SAMBA is a model of South America's electricity supply. Each country's electricity supply system and transmission links between them have been represented. The model is open source and written in OSeMOSYS. Interactive results from the model are available on the OSeMOSYS website. SAMBA is being constantly updated and the current version is SAMBA_0508. In the coming months, KTH-dESA will continue to conduct OSeMOSYS training workshops in Uganda, Bolivia and Nicaragua in support of UN-DESA and the respective national governments. 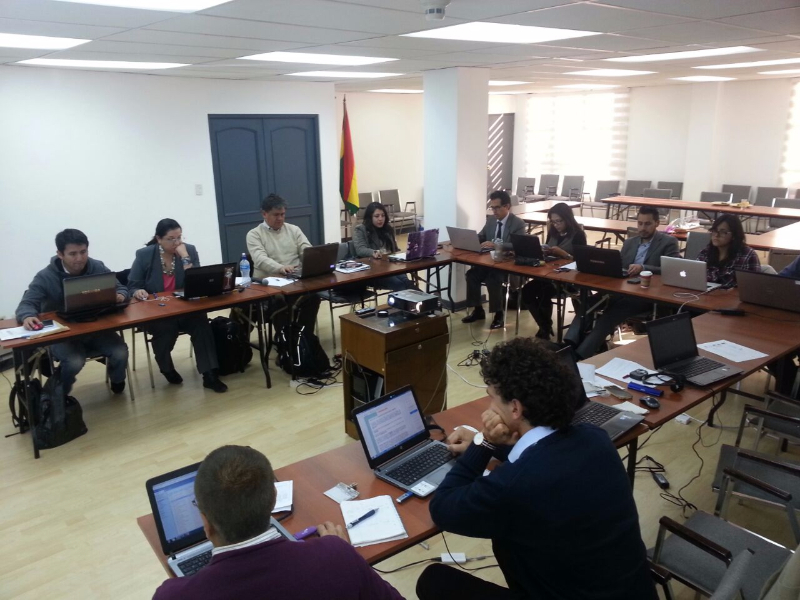 Plans to expand these training workshops to other countries in South and Central America in the future are envisioned. 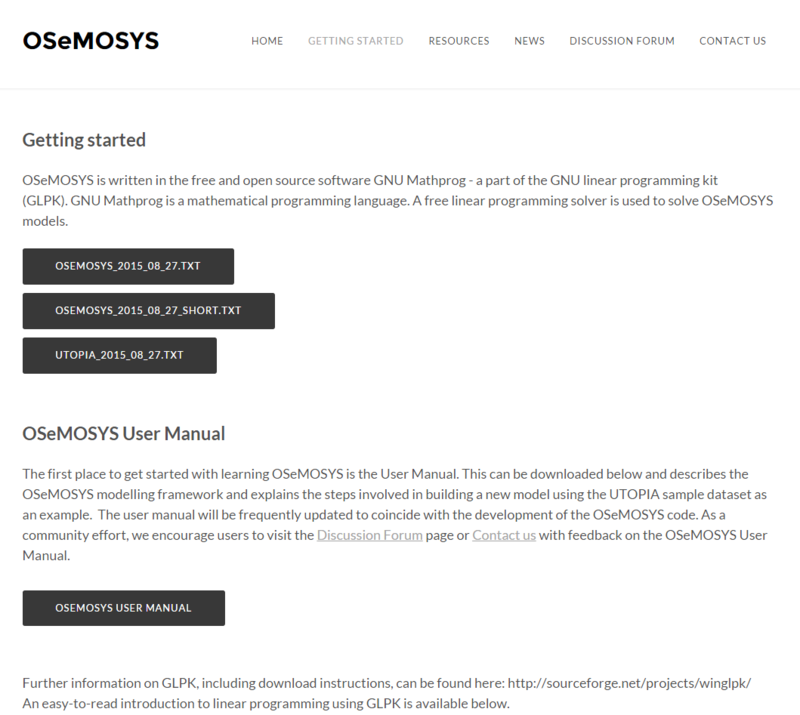 Anyone who has been using OSeMOSYS (in its GNU Mathprog version) and wishes to use the General Algebraic Modeling System (GAMS) can now do so with the GAMS translation of OSeMOSYS. A working paper related to this can be found on the OSeMOSYS website. 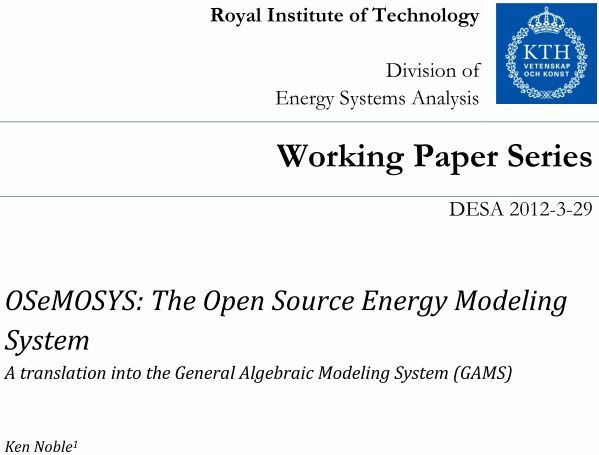 With the GAMS version of OSeMOSYS, users will be able to use potentially more powerful commercial solvers for solving large scale energy system models. In the coming months, KTH-dESA will continue to conduct OSeMOSYS training workshops in Uganda, Bolivia and Nicaragua in support of UN-DESA and the respective national governments. Plans to expand these training workshops to other countries in South and Central America in the future is envisioned. 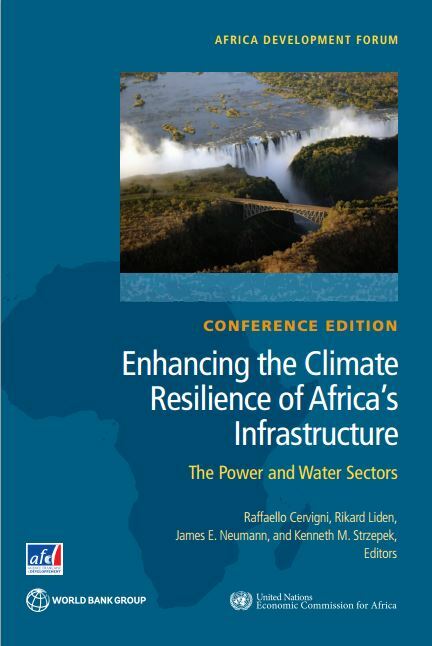 A new report from the World Bank, “Enhancing the Climate Resilience of Africa’s Infrastructure”, was released in Washington on April 27, 2015. The report examines climate change impacts on hydropower, irrigation and electricity expansion in Africa and finds that the continent’s economic growth prospects can be improved by fully integrating future climate changes into infrastructure planning. 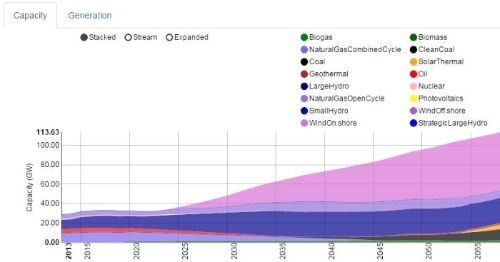 A key aspect of the work is energy system modelling results from OSeMOSYS, which are used for country-level assessments of the climate resilience of energy infrastructure. Further information on the work and final report can be found here. The World Bank will present work done on assessing the Climate Resilience of African Infrastructure at the Africa Climate Resilient Infrastructure Summit in Addis Ababa, Ethiopia. A key aspect of the work is energy system modelling result from OSeMOSYS, which are used for country-level assessments of the climate resilience of energy infrastructure. Further information on the summit can be found here. The full report is expected to be released by the World Bank in the coming weeks. Following the recent completion of the National Climate Change Response Strategy (NCCRS) the Government of Zimbabwe is developing a National Climate Policy (NCP). The Government intends to launch this document at the meeting of the Conference of the Parties of the UN framework convention on climate change in Paris in December of 2015. 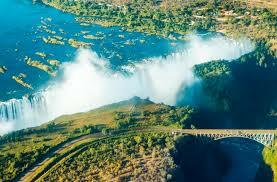 KTH-dESA, in collaboration with the World Bank, supported this effort by sharing Zimbabwe-specific results and analysis from previous work on Assessing the Climate Resilience of African Infrastructure at a workshop on April 8, 2015 in Harare, Zimbabwe. 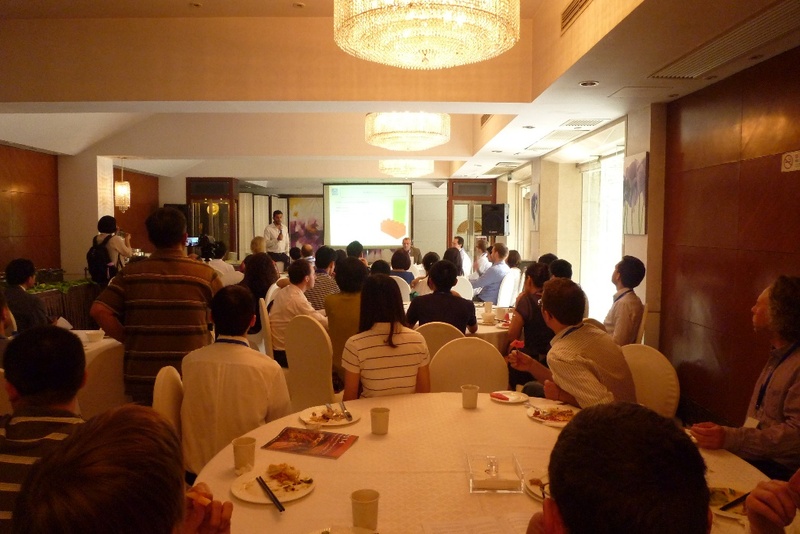 Organised by the CLUSTER program, the SEEEP PhD Spring School was conducted between 1-15 March. The Spring School brought together 15-18 professors from both Chinese and European universities, teaching up to 70 PhD students. 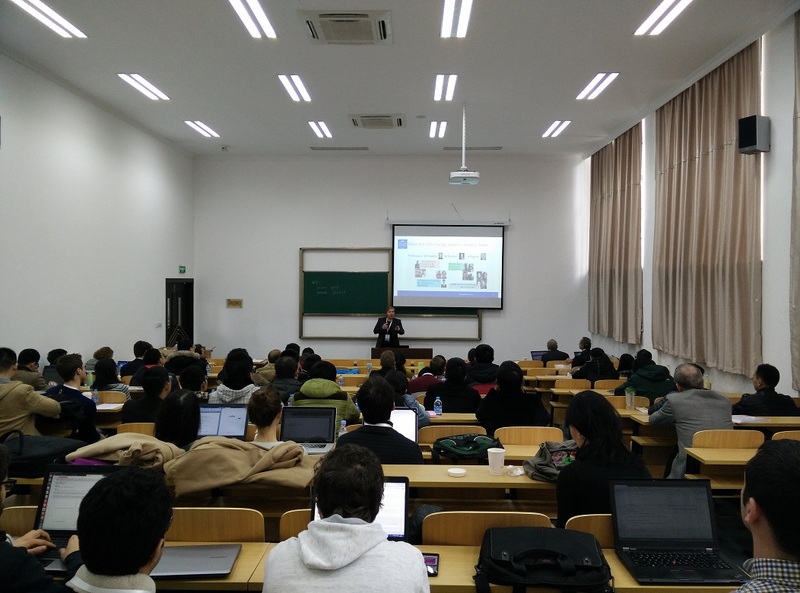 An OSeMOSYS training session was conducted and a group of PhD students developed a model of China's energy system with the aim of its decarbonisation by 2040. 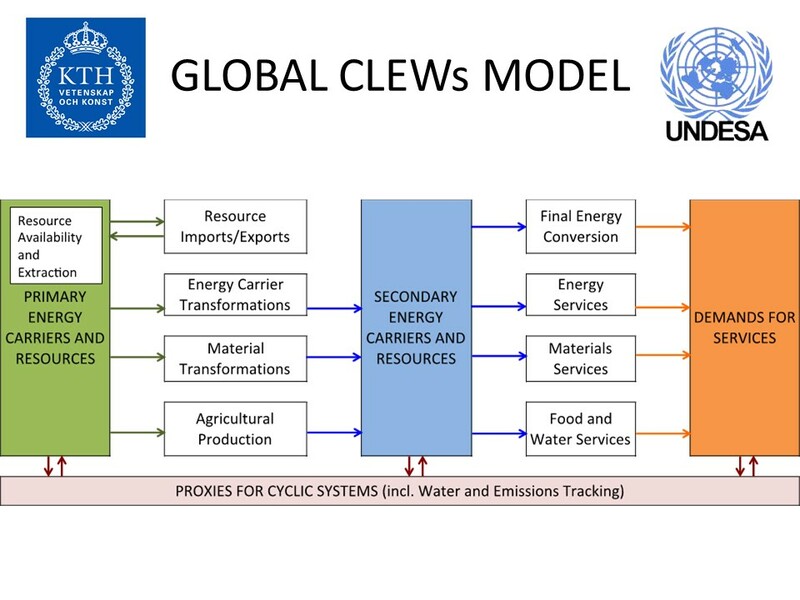 KTH-dESA, in collaboration with the UN, has developed an open-source global CLEWs model. The model results will help bring forward the discussion on a global resources in relation to discussion on the relations of global resource use with social, economic and environmental concerns. Preliminary results show that the CLEWs approach reaches significantly different results from single sector modules (i.e. the separate energy sector). The model features in the UN's Global Sustainable Development Report and is available online through the OSeMOSYS website. 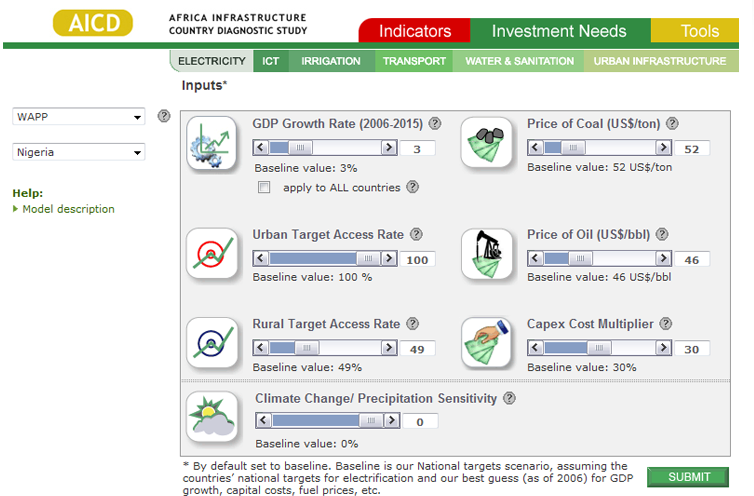 OSeMOSYS was used to model the energy component of a World Bank project on Assessing African Infrastructure’s vulnerability to Climate Change, in collaboration with the RAND Corporation, Indecon, the Stockholm Environment Institute (SEI-US), and Massachusetts Institute of technology (MIT). Further, KTH-dESA worked with the African Development Bank to develop country-level OSeMOSYS models to provide support for national energy investment decisions. The results from both projects will be published in 2015. The International Energy Workshop and the Chinese Energy Research Institute hosted an OSeMOSYS side-event, presenting the most recent developments in the OSeMOSYS community. 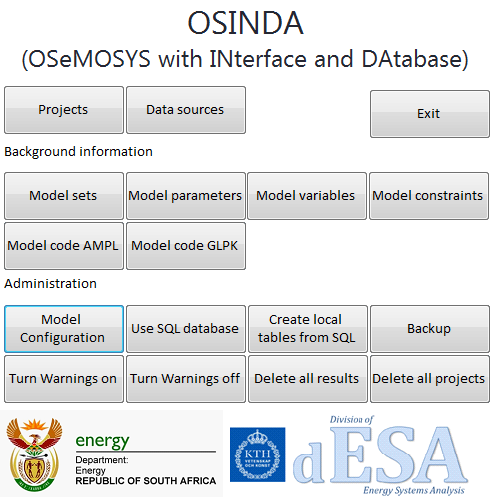 Most significant was the launch the newly developed and freely available OSeMOSYS interface OSINDA (OSemosys INterface and DAtabase) developed in close collaboration with the Department of Energy of South Africa. 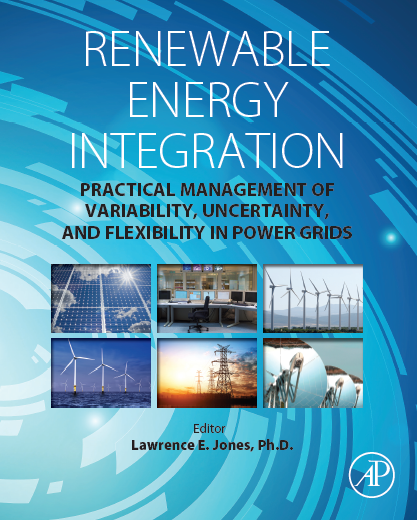 The side-event attracted more than fifty leading researchers in the field of energy modelling. 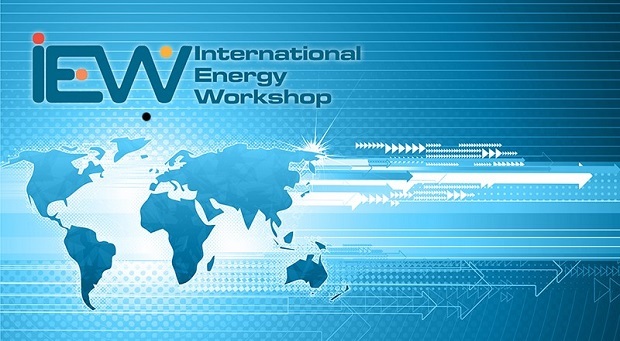 Receiving over hundreds of applications every year, the International Energy Workshop is one of the leading fora for the international energy modelling research community. KTH-dESA made use of this opportunity to present its latest research, including Manuel Welsch's work on "Incorporating Flexibility Requirements into Long-term Models", using Ireland as a case study. Further, Nawfal Saadi presented “An open source approach to Sweden’s energy future” based on a model developed in OSeMOSYS. 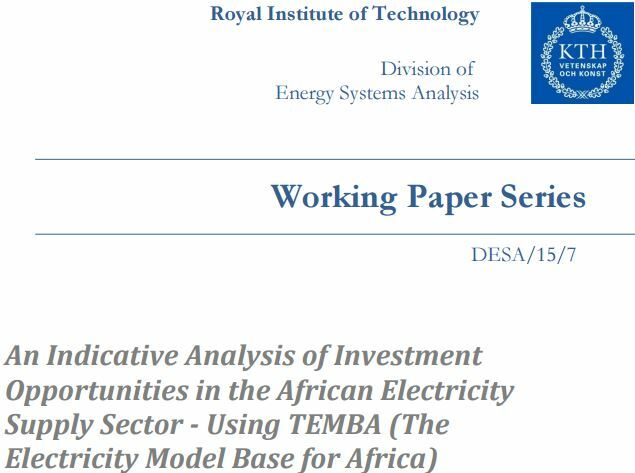 KTH-dESA has the privilege of contributing results from OSeMOSYS model runs to the Africa chapter of the World Energy Outlook (WEO) 2014, a flagship publication of the International Energy Agency (IEA). 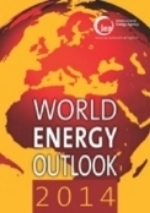 WEO 2014 will be published on 13th October 2014. OSeMOSYS is also being used as the foundation for the energy systems component of an ongoing World Bank project on "Assessing African Infrastructure’s vulnerability to Climate Change" - a project in collaboration with Massachusetts Institute of technology (MIT), RAND Corporation, Indecon, and the Stockholm Environment Institute (SEI). Furthermore, the African Development Bank (AfDB) has contracted KTH-dESA to develop country level energy systems models using OSeMOSYS for multiple African nations to provide support for energy investment decisions. The results and key messages from both projects will be published in the last quarter of 2014.